With the Holidays almost here I’m sure some of you will be hosting guests in your home. Whether it will be just for a day or for a week, you are going to need to feed them. 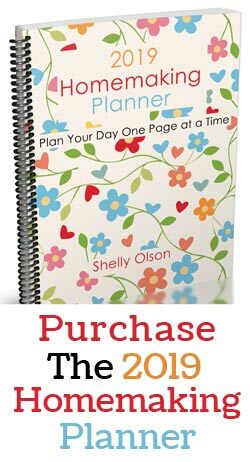 It can be hard to stay on budget and have the time to make meals for when you are hosting guests but if you have a plan it can be easier. I’ve gathered some easy to make and relatively inexpensive recipes to give a try the next time you need to feed a crowd. Most of the recipes feed 6 or more people If you need to feed more just double the recipe. I’ve also included quite a few crockpot recipes. I’ve found by using a crockpot you can transform a less expensive piece of meat into a yummy and tender dish. If you need to double some of the crockpot dishes you might need an extra crockpot. Having an extra borrowed one might be a good idea if you own one crockpot. I’ve broken the recipes down into the type of meat the recipe uses. So if you see a sale on chicken breasts you can look over the chicken recipes more easily. I’ve tried to add a few notes beside each of the recipes to give you an idea about them. But be sure to click the link to find the recipe. Easy Slow Cooker Beef Roast, this is one of my own recipes and you can use an inexpensive chuck roast and after it cooks in the crock pot it will turn out tender and delicious. Add potatoes and carrots to complete the meal. Use the drippings to make a yummy gravy too. Easy Slow Cooker Beef Stroganoff, this recipe takes just a few ingredients and serves 8 people. Serve over egg noodles with a salad and you have a meal. Roast Beef Sandwiches, this would be a great dinner or lunch idea for a crowd. Pick up a few packages of hoagie rolls and cook a nice chuck roast in the slow cooker. Once done shred and place on the buns for a quick an easy lunch or dinner. Easy Slow Cooker Lasagna, Layer the ingredients and let it cook, you don’t even have to boil the noodles first. Serve with garlic bread and a salad. Cowboy Casserole, this dish combines a layer of tater tots on top of the casserole and on the bottom too. With a delicious ground beef and cheese filling. Cheesy Burrito Casserole, this dish is layered making it come together easily. It’s made in a 9 by 13-inch pan to feed 6-8 people. Easy Hamburger Dish, this recipe is an easy meat and potatoes layered dish. It’s easy to assemble and can be made in a crockpot or in the oven. It serves six but can easily be doubled to serve more. Crockpot No-Boil Manicotti, this dish looks delicious. It’s like an easy manicotti recipe that cooks by itself in the crockpot. Serves about 6 but you could make an extra batch in another crockpot to feed more. Slow Cooker Beef and Bean Enchiladas, this recipe is a layered recipe so it can be made quickly. Serves 6 but could be doubled. This is one of our favorite slow cooker dishes. Ground Beef Casserole, pasta, beef, and cheese combine with a few other ingredients to make this easy to prepare dinner dish. Italian Chicken, Prepare this ahead of time with the chicken in the marinade in the freezer. Then just thaw and cook in the crockpot until done. Makes for a super easy dish. Simple Company Chicken, this dish combines chicken, bacon and dried beef. It also looks to be very easy to make. Serves 6 but it could easily be doubled to serve more. Crock Pot Chicken and Rice, this is a simple rice dish that would come together really quickly on a busy day. Just 6 ingredients needed for this dinner. Feeds 6 people but it could be doubled, you might need an extra crock pot if this dish needs to be doubled. Slow Cooker Barbecue Chicken, 3 ingredients and a slow cooker are all that’s needed to make these delicious chicken sandwiches. Chicken Spaghetti, this recipe makes three 8-inch square pan dinners. It’s also freezer friendly so it can be made ahead and pulled out of the freezer when you need it. Easy Slow Cooker Chicken Tacos, For this dish you cook the chicken in the crock pot then make the sauce in the crock pot too. Set out bowls of taco fixings and let everyone make their own tacos. Serve with chips, salsa, beans, and rice for an easy dinner. Slow Cooker Garlic Butter Chicken with Cream Cheese Sauce, the name of this recipe just sounds divine and when it only takes 5 ingredients to make there’s really no reason to not give this recipe a try. This recipe looks to serve 6-8. Slow Cooker Greek Chicken Tacos, this combination looks so delicious. It serves 6-8 people but could be doubled for more. Slow Cooker Cheesy Ranch Chicken, 4 ingredients meld together to make a tasty and easy dish. This recipe looks to serve about 4-6 people but could be doubled for more. Slow Cooker Portobello Mushroom, Chicken, and Potato, A full dinner in the slow cooker. This recipe is sure to serve 6 if not more. Serve with a side salad and dinner is done. 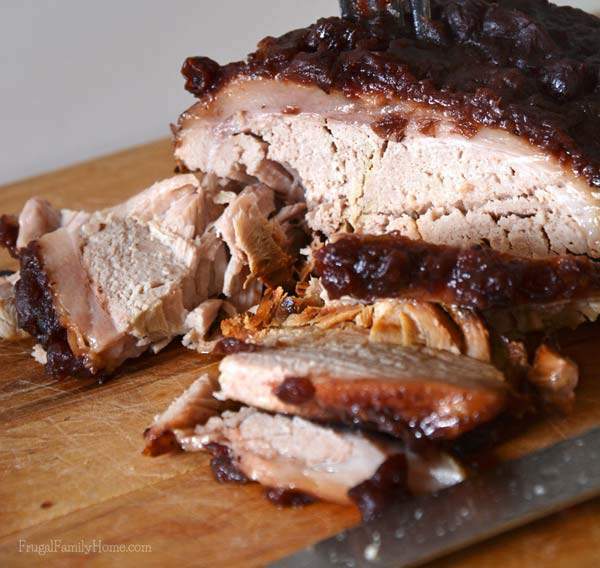 Cranberry Pork Roast, start with an inexpensive pork roast or purchase a pork loin at Costco for around $2 a pound. Add a few ingredient and dinner just needs to cook to perfection in the slow cooker. 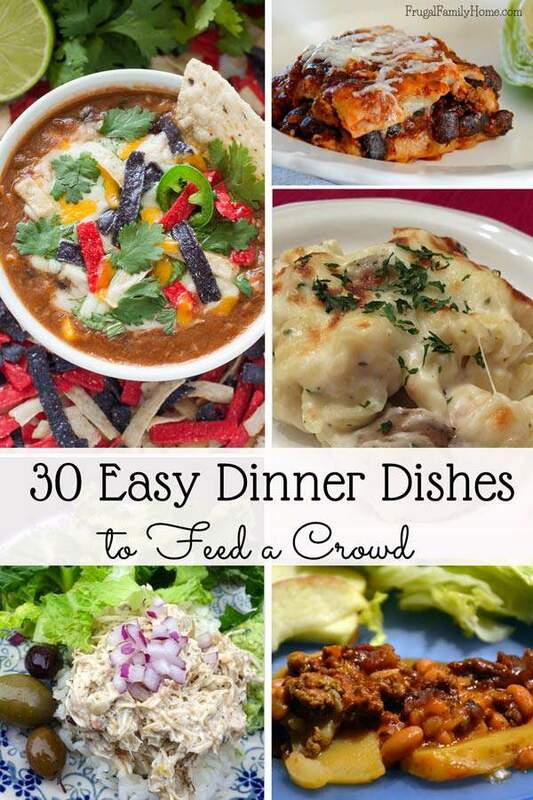 This is great for a fancier dinner, make a salad and roasted sweet potatoes to make it a meal. Macaroni Pizza Casserole, this recipe looks like a great large crowd take on pizza. It has sausage some veggies and cheese, all baked to perfection. Sweet and Spicy Root Beer Pork, it’s pulled pork from your slow cooker. Serve on buns with coleslaw for a yummy hand-held dinner. Sundried Tomato Sausage and Alfredo Pasta Bake, Make your own Alfredo sauce with this recipe and add in sausage, pasta, and cheese and you have a hearty pasta meal. This recipe makes a 9 by 13-inch pan so it would serve at least 8 I’m sure. Chicken Pot Pie Soup, this is a soup that tastes just like pot pie. It a delicious and hearty soup. Easy to make when you start with pre-cooked chicken. This recipe serves 6 so be sure to double for more. 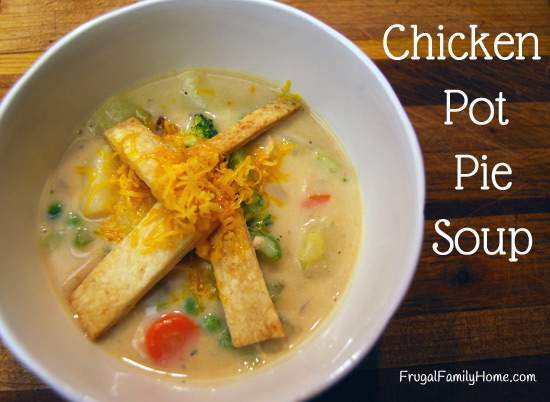 Creamy Crockpot Chicken Potato Soup, 7 ingredients to add to the crockpot and dinner is underway in about 5 minutes. Crockpot Taco Soup, This recipe uses canned beans and tomatoes, making it an easy one to get started on a busy day. Double the recipe for more than 6 people. Chicken Tortilla Soup, this soup recipe feed 6 but could easily be doubled. 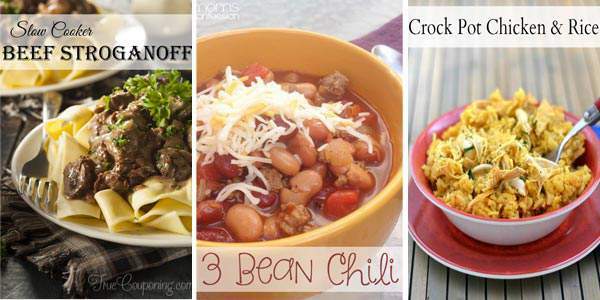 You can use cooked or canned beans making this an easy recipe to get started in the morning. The flavor combination in this recipes sounds delicious. Hamburger Soup, this soup comes together in just 30 minutes and only takes a few ingredients too. Making for a very economical dinner for a crowd. This recipe feeds about 8 but can be doubled to feed more. 3 Bean Chili, making a batch of chili is alway a great way to feed a crowd. This chili has three beans in it and is done in a little over an hour. It serves 4-6 people so be sure to double it if you’ll be cooking for more. I hope you find a recipe or two to give a try to serve your guests. If you need more recipe ideas you can see all of my recipes here. 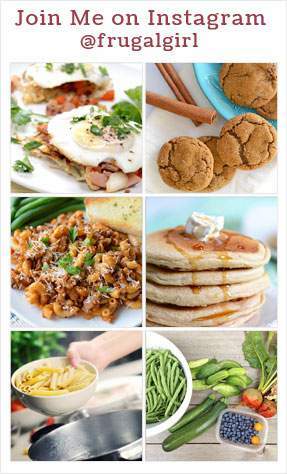 If you are looking for frugal recipes be sure to check the 4 weeks of frugal recipes series. If you enjoyed this article, be sure to share it with your family and friends. You can scroll down to find the sharing buttons for easy sharing. Thanks for sharing! Thanks for pinning it, Erin!